New methods link atmospheric CO2 to climate change. April 27, 2013. When researchers study past climates to better understand modern warming, they often seek “climate analogues,” times when climatic variables resembled those we face today. According to celebrated climatologist André Berger, problems emerge when we start asking which variables render climates analogous. Is it temperature? Sea level? Patterns of vegetation? Forcing influences? Unfortunately for climatologists and climate historians, superficially similar climates can emerge from very different stimuli, and they can be expressed in very different ways in different places. Almost 34 million years ago, the world’s climate changed and, as it did, ice sheets extended across the Antarctic. Ice reflects sunlight better than water, and the dramatic expansion of Antarctic ice stimulated a long-term decline in ocean temperatures. Despite recent warming, the colder climate that emerged from this Eocene–Oligocene transition actually resembles our own. We live in an icy – if thawing – climate, and global warming is alarming not because it imperils life on Earth, but because it threatens how modern life has adjusted to regional environments. Just as polar bears need ice to hunt, our civilization requires moderate, predictable temperatures for the agricultural monocultures that sustain it. Regardless, our world is warming today largely because atmospheric concentrations of carbon dioxide are increasing, preventing the sun’s warmth from radiating back into space. Millions of years ago, the Oligocene dawned because atmospheric carbon dioxide decreased, prompting overall global cooling that, again, was exacerbated by the expansion of polar ice. Still, studies of temperatures on land have yielded mixed results, complicating attempts to use the ensuing climate as an analogue for modern conditions. A recent study in Proceedings of the National Academy of Sciences uses a new geochemical technique to resolve this apparent paradox. By using cores exhumed from the ocean, scientists have reconstructed past climatic shifts by measuring carbon and oxygen isotopes in fossilized sea life. Changes in the abundance of these isotopes reflect variations in temperature, and it is these changes that have informed how climatologists understand the period. 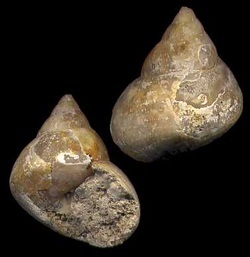 However, lead author Michael Hren and his colleagues have examined the shells of fossilized snails (Viviparus lentus) not only to explore variations in carbon and oxygen isotopes, but also to record shifts in how these isotopes were connected. The new results reveal a startling heterogeneity of climatic responses to decreases in atmospheric carbon dioxide and increases in Antarctic ice cover. Still, land temperatures across northern Europe and North America appear to have dropped by at least four degrees Celsius, with significant consequences for contemporary fauna and flora. Ultimately, by using novel techniques this study confirms that changes in carbon dioxide and resulting shifts in polar ice cover have dramatically affected temperatures on land. The results offer fresh insight – and an urgent warning – as greenhouse gases continue to accumulate in the atmosphere today. Michael T. Hren et al., "Terrestrial cooling in Northern Europe during the Eocene–Oligocene transition" Proceedings of the National Academy of Sciences (2013). André Berger, Qiuzhen Yin, Nicholas Herold, "About the difficulty to find a Pleistocene analogue to the Holocene and Anthropocene" PAGES 4th OSM, Goa, India.